Superliner Gel Intenza is incredibly versatile to use. It provides all the ease of a pencil eye liner with the durability of liquid. It is easy to apply, and unlike liquid, it can blend beautifully into the eye shadow to create high eye definition. So whether you want to pull off a 1960s defined flick, or the classically chic smokey effect, Superliner Gel Intenza will achieve it with ease. Does not smear, fade, rub off or stain the lids. 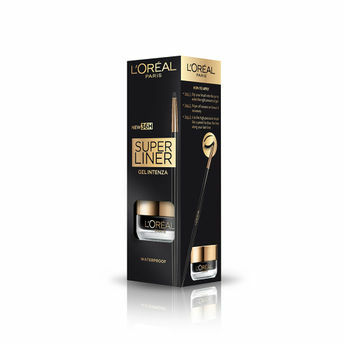 So, create your own signature look this season and dare to be graphic with 5 intense designer shades of L'Oreal Paris Superliner Gel Intenza! Explore the entire range of Eyeliner available on Nykaa. Shop more L'Oreal Paris products here.You can browse through the complete world of L'Oreal Paris Eyeliner .